Swing Theater (“Movey”), 2014, metal mesh, metal pipe, drawing on clear acrylic sheet, LED light, and paint. Photo: Hai Zhang. Slope, 2014, wood, tar paper, light and silver roof paint. Photo: Hai Zhang. 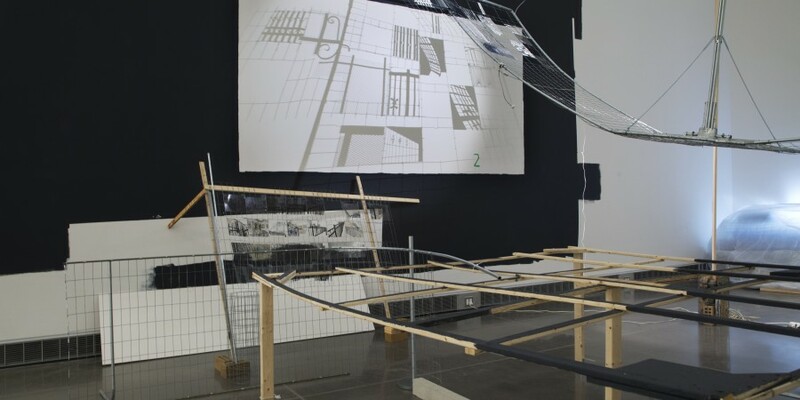 Installation view, Black Hideout and Slope. Photo: Hai Zhang. Detail from: Swing Theater (“Movey”), 2014, metal mesh, metal pipe, drawing on clear acrylic sheet, LED light, and paint. Photo: Hai Zhang. Since the early 1990s, Jewyo Rhii has worked in sculptural installation, video, drawing, performance and publications. Constantly displacing herself from her native Seoul, Korea, to study and work in Western Europe and the US, Rhii has come to embrace this fluid lifestyle as an integral part of her process, in such a way that her studios have functioned as exhibition spaces, and exhibition spaces as studios. 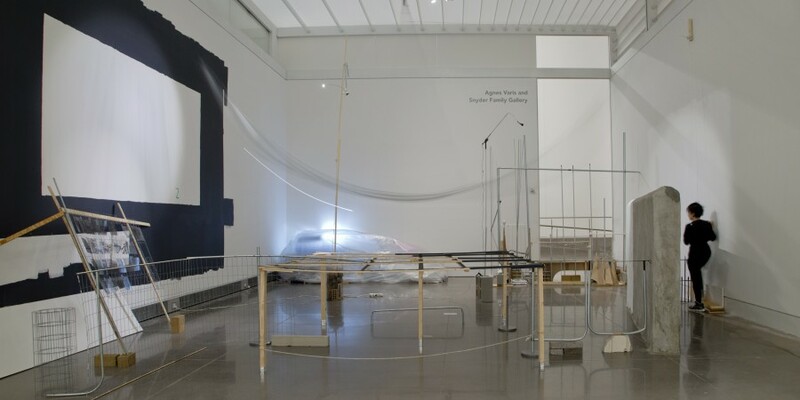 Having occupied a studio space at the Queens Museum since November 2013, Rhii developed this sprawling sculptural installation, with its multiple components, to materialize her transplantation to the borough of Queens. Rhii explores the intuitive and experiential aspects of being a newcomer. Bringing to the fore both the psychology and physicality, her installation can only be experienced as the visitor actively moves through the gallery space and observes the various components both individually and as a single body. The installation pieces together fragments of Queens as the artist has lived it—a rooftop of a low-rise building as glimpsed from the elevated subway track, fences of houses, and snippets of daily life as seen on the streets. These are visual coincidences and physical uncertainties of local color perceived by Rhii, often with a sense of hesitation, discomfort, and pure awe. 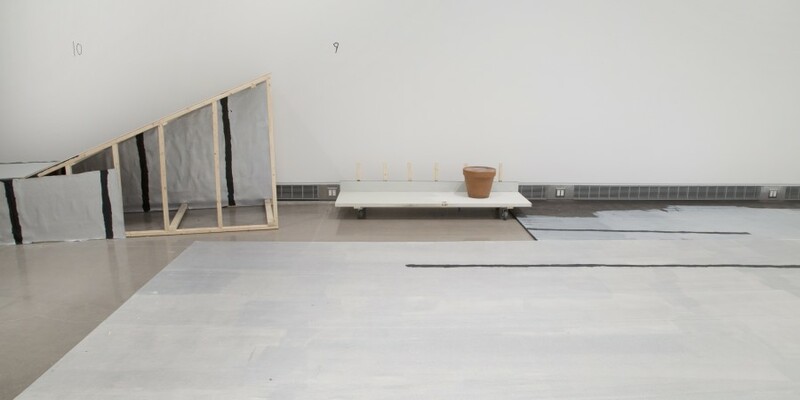 Commonly Newcomer is also an extension of a collaborative publication titled Outside the Comfort Zone, written by Irene Veenstra, a Dutch art historian who visited Rhii’s 2013 exhibition at the Van Abbemuseum in Eindhoven, Netherlands, for nine consecutive days. During this time, Veenstra wrote a wide-ranging, impressionistic text that touched on her own life, art history, and contemporary issues, using the works in Rhii’s exhibition as a jumping-off point. 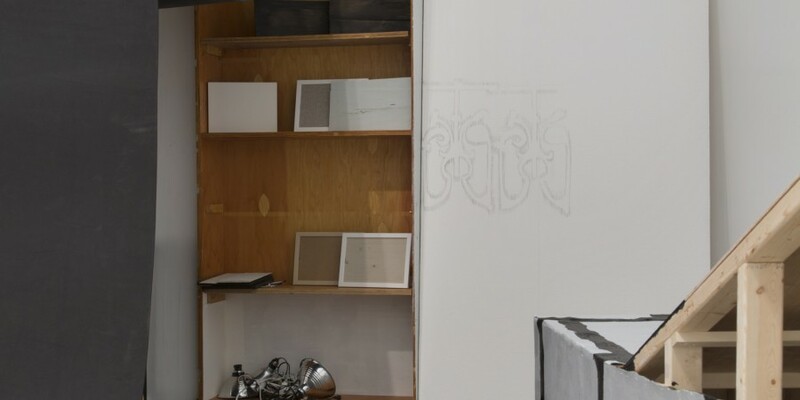 In Commonly Newcomer, Rhii experiments with re-materializing a textual incarnation of her previous work, while adopting and adapting it into her present life in Queens. Jewyo Rhii (b. 1971, Seoul) studied in Seoul, London and Amsterdam. Recent solo exhibitions include Wall To Talk To at the Van Abbemuseum, Eindhoven, Netherlands; Museum fur Modern Kunst, Frankfurt; the Artsonje Center, Seoul (2011-2013, traveling); Night Studio, Itaewon, Seoul (2010); Lodged, Ursula Walbrol Gallery, Dusseldorf, Germany (2010), and Muscle Aches: Arrivals, Doosan Gallery, New York, USA (2009). Recent group exhibitions include Media City Seoul, Korea (2010), Everyday Miracle (Extended), REDCAT, Los Angeles (2009), On The Road & Insertation, the 7th Gwangju Biennale, Gwangju, Korea (2008). In 2010 she was awarded the prestigious Yanghyun Prize. She has lived in New York since November 2013, focusing on the Queens Museum exhibition. Special thanks to Ikjung Cho, Eunsun Choi, Ji Youn Hong, Boram Jang, Bo Kim, Su Jung Kim, and Susan Lee for their assistance in the installation. Commonly Newcomer is supported by Nexon and Ford Foundation. 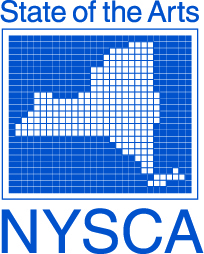 Additional support provided by the New York City Department of Cultural Affairs and New York State Council on the Arts with the support of Governor Andrew Cuomo and the New York State Legislature.